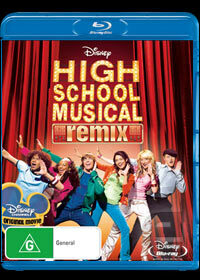 The original and the best has arrived on Blu-Ray in High School Musical: Remix which stars Zac Efron and Vanessa Anne Hudgens which contains a great storyline and a healthy dose of music to keep viewers of all ages entertained. The delightful and talented Efron plays the loveable “jock” Troy, the captain of his school’s basketball team, whereas Hudgens plays the beautiful academic Gabriella who shock their friends and acquaintances when they audition for their high school’s musical. Although the movie is quite clichéd at times, it’s a fun film that features some great modern songs and dance numbers that it’s easy to understand how this movie became so popular and created some equally entertaining sequels. Where the Blu-Ray version does shine is through the special features and the video/audio quality that include high definition video and audio which go hand-in-hand with the enthralling storyline. The picture quality is extremely sharp that is matched with vibrant colours and really lends itself well to the Blu-Ray format. The high definition 5.1 audio track is pure bliss, especially when the songs began which makes it difficult not to get up and start dancing. My favourite special feature is the “Dance Along” which will teach the younger viewers some great dance steps. Match that with some great featurettes from the High School Reunion to the Hollywood Premier and fans will be in High School Musical heaven.